Hay is a natural source of fibre for small animals and a substitute for grass, but also a great foraging material that's high in beneficial nutrients, unlike straw which is much lower in nutrition and suitable for bedding. 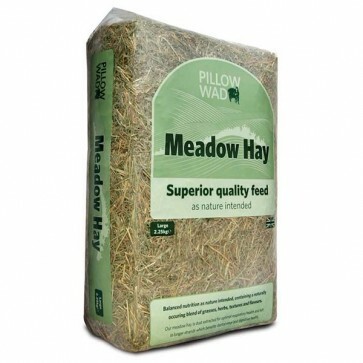 Each hay pillow is harvested from established meadows that contain a blend of naturally occurring grasses, herbs, textures and flavours packed full of nutrition, that's dust extracted and sieved to remove dust spores. The meadow hay is also left un-chopped to leave high quality, long strands that increase dental wear and help digestive health. The Large Pillows of Meadow Hay are highly compressed and available in two sizes: a 2.25kg pillow wad size that's approximately 35 x 13 x 52 cm and also a larger maxi size that's 3.75kg making them good value for money. Please note hay should always be provided to Rabbits, Guinea Pigs and Chinchillas to aid dental wear for their continually growing teeth, but also to help ensure your small animal receives a nutritionally balanced diet.